After two-and-a-half years, the Revive Seventh-day Adventist group in Cleveland was officially organized last fall as the Revive Mission church. Approximately 40 members attended the ceremony, held at the First Cleveland Spanish church—the group’s “mother” or home church. 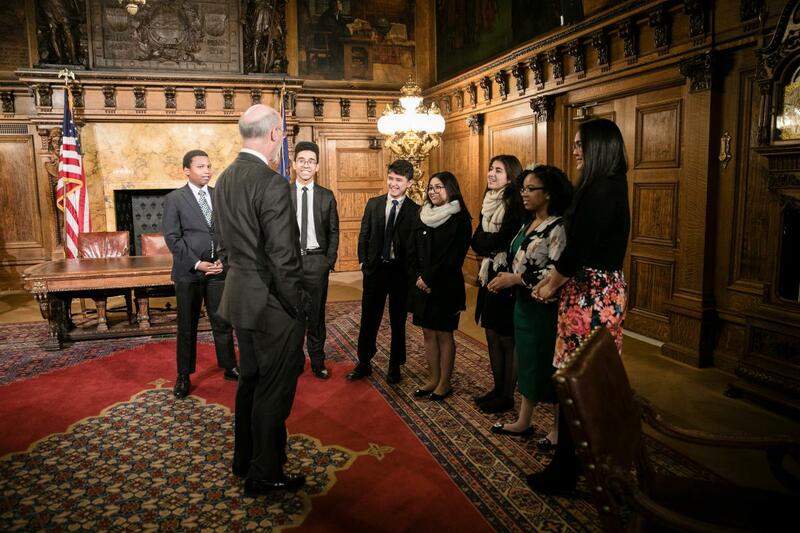 Members of Blue Mountain Academy's Assist group recently had a wonderful civics lesson as they joined director Craig Johnson visiting the Pennsylvania State Capitol of Harrisburg to visit with Governor Tom Wolf. Johnson is looking to expand the visits to state senators and the governors office to more students next year. Although Chesapeake Conference's Atholton church in Columbia, Md., concluded a Revelation Today prophecy seminar last fall, their evangelistic effort is still bearing fruit. Seminar attendee Krystal Moreland recently took her stand for Christ through baptism. Her story, however, is unique from others who participated in the meetings. Adventist HealthCare Rehabilitation (Adventist Rehabilitation) is excited to announce it has received approval for its White Oak Certificate of Need from the Maryland Health Care Commission. The approval allows Adventist Rehabilitation to move its services from Takoma Park to Adventist HealthCare White Oak Medical Center (White Oak Medical Center) in 2020. Adventist HealthCare’s two Advanced Wound Care & Hyperbaric Medicine Centers have received the Robert A. Warriner III, M.D., Center of Excellence award from Healogics, the nation’s largest provider of advanced wound care services. Adventist HealthCare Shady Grove Medical Center in Rockville, Md., and Adventist HealthCare Washington Adventist Hospital in Takoma Park, Md., offer highly specialized wound care to patients suffering from diabetic ulcers, pressure ulcers, infections and other chronic wounds that have not healed in a reasonable amount of time. Christian Record’s Annual Day of Giving promotion is Sabbath, April 13, 2019, and it is the emphasis for the World Budget offering.